Things are snowy here in the Inland Northwest...we awoke to more blustery conditions to start off the new year. It began with a very short night of sleep (like many of my readers, I am sure!) but we had loads of fun at a New Year's Eve Pinochle Party with 5 tables (thanks, Nances!). ...here's wishing all my blog visitors a very Happy New Year! of good friends, loving family and security in the midst of uncertain times. And may 2009 be marked by warmth and delight. I offer a few collages of some holiday activities to bid adieu to 2008. 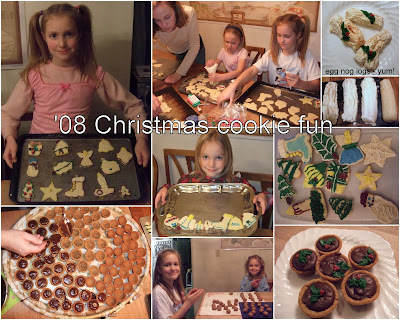 I would be happy to share recipes for the our family-fav cookies (fudge puddles and eggnog logs). They're yours for the asking--use the comments section. 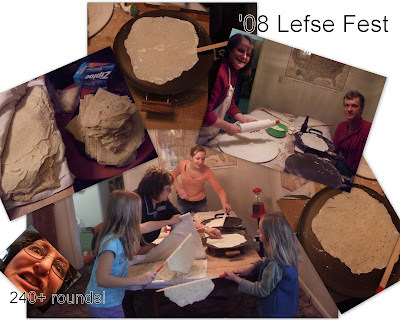 Sorry I don't have more pics of our 5th Annual Lefse Fest. We had about 18 guests and made over 240 rounds. Despite best intentions to have the bulk of it made before the party began, our production didn't get into full swing soon enough for me to put down the lefse sticks and pick up the camera. I should have assigned someone to take pics...something to remember for next year's party. This is an annual event and is loads of fun to introduce people in our sphere to the toothsome delight of fresh lefse. As you can see, even the Littles participate. 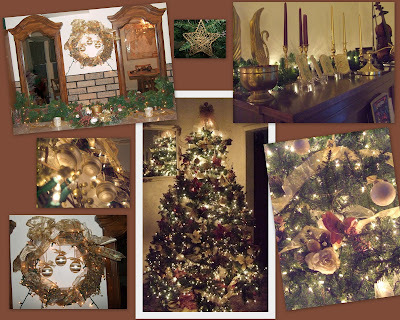 And finally, a holiday decor collage. I am not a traditional red & green gal, and I typically use the same decorating motif about 5 years before I make a change. This is year 5, but I'm not ready to switch yet. As you can see I currently favor greens, white lights, florals and gilded/beaded fruits. This particular tree design is my all-time fav and has elicited many comments and compliments from visitors to our home. The tree will stay up a few more days...maybe until Epiphany. That's when the tree came down in my childhood home. My sister's and my birthdays are both in early January, which also may have influenced the tradition to keep it up. The greens and lights on my buffet and piano will likely remain until Valentine's Day, simply because I love the soft ambient glow. Since it is just greenery with golds, it doesn't look especially 'Christmas' so I feel like I can get away with it as 'winter' decor. Hope you enjoyed this small glimpse of our holiday home. So, just curious....when do YOU take down all your holiday decor? Happy New Year to you Paula....I love all your photos, the Christmas collages are great. I'm not a red and green gal either myself. Speaking of cookies, I'm sitting here reading your post eating a bunch of Christmas cookies. All the best to you in the new year. Hey Paula; I love how you decorated your tree, it is very pretty. I too love lots of lights on my tree, an almost every where else. lol I used to leave ours up until after Jan 6 that is my oldest daughters birthday, she loved having the tree up. But now all the kids are all married I take the tree down early. I have taken it down already. I love the photos looks like fun. Happy New Year to you too, Paula! It looks like you all have been having a lot of fun. The longest I ever left a tree up was until Valentine's Day. That was when we lived in Oregon and could get Noble Fir so easily and inexpensively at the You-Pick farms there in the Willamette Valley. They are really beautiful trees; the "perfect Christmas tree". They stay fresh a long time too, especially with added water. I think that year might've been the year my youngest was born 2 days after Christmas. Putting away decorations a few days later wasn't a priority. It's not now, either. Our little tree is still up, although I know I'll need to get the decorations put away soon. I'm not in a hurry, though... the tree only got put up a few days before Christmas, so I'm still enjoying the lights and the pretty baubles. I love the looks of concentration with that cookie making! Looks like lots of fun was had your house. Your decorations are beautiful! Thanks for your visits and New Year's greetings! Ruth - I'm looking forward to the new delights you will share in 2009, and hearing more about your well-deserved publicity for your beautiful artwork. Alaura - it will be interesting to see how traditions will change once the kids are grown and gone. For now - the tree remains up! Diana - i do miss the fresh smell of pines, but John appreciates not having it shower down dead needles on him as he removes the tree. Seems we always neglect to keep it full of water and once that happens, there's no saving it. Stefani - I'm so glad you caught that - it is exactly what struck me as I created to collage! They were so intent and the concentration was very evident on their faces. There were plenty of laughs and giggles too, but the camera caught all of them in the grip of creative effort here. Paula, my goodness, I just read the comment you left on my blog and took a look at some of your pictures. No wonder it is so hard for you to take down your decorations! What hard work you have put into your Christmas decorating! They are absolutely beautiful. ...and thanks for visiting! 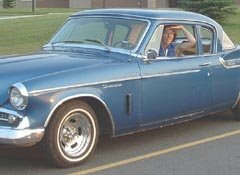 This blog is intended for personal inspiration and enjoyment. Please ask before using content or photos. This instructional video on finger rolling was to be the first of many. But the amount of time & effort required was daunting and the project has been shelved for now. You are welcome to leave feedback or questions in the comment section of any post on my blog. Arte y Pico bestowed by Suzanne from "At Home with the Farmer's Wife"